Put in: public boat ramp on east side of Hwy 82 bridge, east of Town of Alapaha. Water level: just below banks. 1 ft of boat ramp out of water. 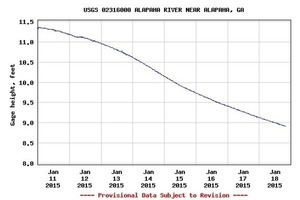 Recent reading of 11 ft on gauge at Alapaha by report [actually 9.3 feet (216.9′ NAVD88), according to USGS. -jsq]. Was good level allowing for easy navigation through most deadfalls. Weather: partly cloudy, cold at start warming to low 60s and nice by finish. No wind. Flora/fauna: maples starting to bloom; cypress, pines, live oak, palmettos, ho lly, water oak, wild blueberries, resurrection fern; heard wood ducks and wood peckers but didn’t see much fauna. There were some tiny, delicate mayfly type insects that flew just above the water for awhile midday. Assessment: good trip. For experienced paddlers at this water level as deadfalls could be difficult. No invasive species seen. Need permission from landowner for takeout. 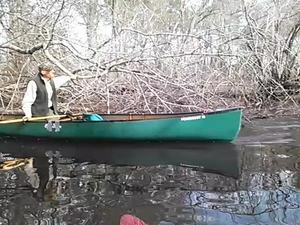 This entry was posted in Blueway, Outing, River and tagged Blueway, Bret Wagenhorst, conservation, Georgia, John S. Quarterman, level, Lowndes County, north Florida, Outing, river, south Georgia, watershed, WWALS, WWALS Watershed Coalition on January 18, 2015 by jsq.